Whitchurch was formed in 1914, and is an undulating course, offering great views down over nearby Cardiff. The course is renowned for its excellent putting surfaces, and the hardest holes are certainly the tough par-4s. The signature hole is the first, where visiting golfers must be brave to challenge the water that guards the front of the green. 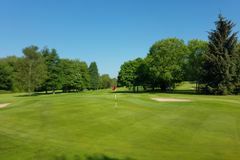 Lying just three and a half miles north of the City of Cardiff is Whitchurch Golf Club. The clubhouse itself even has the pleasure of being situated on elevated ground which means it can offer views over the city. Founded almost 100 years ago the course has matured into a fabulous eighteen hole parkland course with fine greeens. The course is most noted for its testing par fours and par three holes. The first hole requires a steady nerve to negotiate the large water feature in front of the green. And from then on in you will have to negotiate around a tricky course.